Doctor Who returned last night, and brought with it a whole new look, a whole new cast, and a whole new Doctor in the form of Jodie Whittaker. There were thrills! Chills! Lots of accents! It had so much, we just had to grab a few people to hash it all out. “The Woman Who Fell to Earth” had the job not just of introducing us to the newest Doctor—a half hour since she was unceremoniously punted out of her own TARDIS—but also the Doctor’s new circle of friends: Yaz, Ryan, and Graham, tied together by the sinister threat of a toothsome villain by the name of Tim Shaw...sort of. 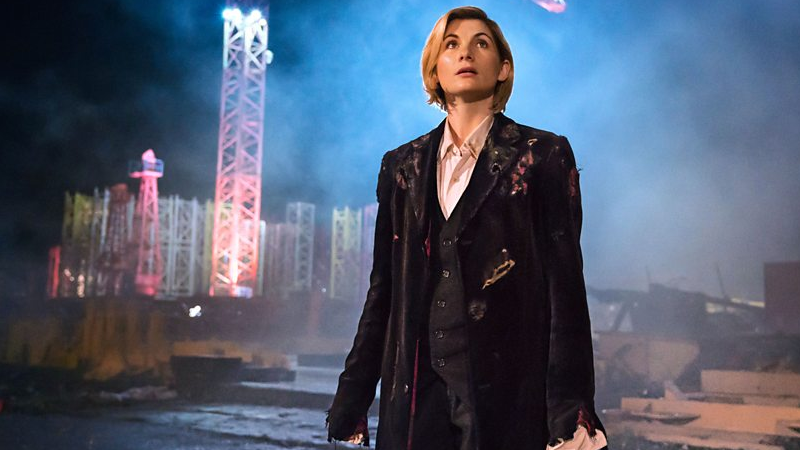 While a bit more down to earth—literally!—in its tone and pacing than your usual episode of Doctor Who, “The Woman Who Fell to Earth” (which scored big in ratings) had a lot to do in order to bring us back into the timey-wimey world of the show, and it did so in a manner and style that’s nothing like the series has done before. To take us through the highs and lows, the sonic screwdrivers and the DNA bombs, the alien pods and the mobile phone defibrillators, I (your usual guide to Time and Space, James Whitbrook) recruited fellow Whovians Jill Pantozzi and Beth Elderkin to talk about what we loved and what we didn’t about Jodie Whittaker’s grand debut. James Whitbrook: Welcome, fellow Time Lords, to the Gallifreyan Panopticon that is...our work Slack. Doctor Who finally came back last night, bringing with it a whole new cast, a brand new Doctor, and as many creepy teeth aliens as there were regional British accents. What did we think? Beth Elderkin: Overall, I had a blast. The new Doctor is in and she is fantastic. Jill Pantozzi: I. Am. SO. HAPPY. James: I honestly can’t think of the last time I’ve seen so much enthusiasm over an episode of Who. While I didn’t love a few elements of the episode, they’re so inconsequential to the things I did love that I was really pleased with how it kicked off. Beth: Same here. There were a few things that didn’t sit right with me—justice for dead Grams, please. But it was a solid debut and Jodie Whittaker just slid right into that role as if it was made for her. Jill: I think overall I expected a much grander premiere episode, but I actually like that it was more contained. Beth: I mean, we’re all very used to the grandiose Stephen Moffat style of Doctor Who, this debut definitely had the feel of another person behind the wheel—meaning Chris Chibnall. James: That might have been one of my favorite aspects, actually. It was so nice to have a story that wasn’t about the immediate end of the world for everything with all sorts of explosions and whatnot. It was just one weird little thing made important by the Doctor’s conviction to safeguard everyone and everything on Earth. Beth: I could’ve done with a bit more sunlight though. James: That’s how you know it’s fancy drama though, more scenes at night! Before we talk about the Doctor and her new friends, that’s one thing I wanted to say, actually: Holy cow, this looks like no other episode of Doctor Who before. Not just because of the new aspect ratio stuff, but the cinematography was great. You sort of forget that 99 percent of it takes place in darkly lit alleys in Sheffield and a construction site, because of it. Beth: The cinematography had a lot of movement, it felt alive and engaging. Jill: I’m definitely looking forward to how that’s kept up throughout the season and in different locales. Beth: I have seen some people upset that it doesn’t look like previous Doctor Who, or that it’s too “Hollywood” now. I don’t really have an opinion one way or another on that, as I’ve always cared more about the characters than the style, but I’m curious what y’all think about that. James: I think Doctor Who will always have that sort of underdog charm, that it’s trying to put on a space opera with bits of string and bubble wrap. But it can evoke that retro campiness while still looking really, really nice—which I think this episode did with all the beaten up, cobbled-together tech and stuff. I’d expect that old...I don’t want to say crumminess, but that’s sort of what it is, that scrappy commitment to doing a lot with very little, will come in to play as we get to see more out-there locations. If they can make bus stations look this cinematic, just wait till we get alien bus stations! Beth: If you need information, always ask a bus driver. James: Hahaha! Speaking of which, before we even get to the Doctor, let’s touch on the new “companion” team we’ve got in Graham, Yaz, and Ryan, considering we spend so much time with them before the Doctor literally crashes into the story. Got any favorites yet? Jill: Oh I love Yaz! Trying to prove oneself is so relatable. Beth: I really loved Ryan. The actor was really engaging, and while we don’t really have a grasp on who he is, I’m excited to learn more about him. Jill: I also appreciated that while they were all hesitant at first, it really didn’t take much convincing that the Doctor was an alien and they were 100 percent down to follow her. James: A lot of this episode’s emotional work happens because of Ryan and Graham, because of the story—poor Grace, joining the long list of Companions who could’ve been—so I’m hoping to see a little more from Yaz as we go forward, but I think this was a strong start for all three of them. Beth: I am upset about Grace. That was my biggest problem with the episode. I understand why she didn’t survive the episode, but in the end, it becomes another situation where a female character is killed off to free the men to do other things. Otherwise, they would’ve been focused on getting back to her while out in space. James: I was totally expecting them to keep her as the “home base,” like Jackie Tyler or Rory’s dad Brian, so I was sad that she was killed off—but at the same time, I like the idea of her spirit being the thing that connects all three of them to the Doctor. There’s drama in there for Ryan and Graham’s relationship, but how it affects Yaz and how (or even if) it affects the Doctor going forward is something I’m interested in seeing develop. Beth: That said, with the exception of the train driver, every character who was killed in this episode was given some form of context or reason to care about them. In addition to Grace, the guy who took the Hershey’s Kiss Space Module was looking for his sister, and the construction supervisor had that scene with his granddaughter. There’s a lot of death on Doctor Who, and overall I like how they’re handling it so far. James: Except for that drunk guy with his kebab salad. That’s what you get for hurling salad at an alien! Jill: Though, I still wouldn’t have thrown my take out at a mech-looking creature, no matter how drunk I was. Beth: Oh right. I mean, who throws away their kebab salad? Even drunk boys need their leafy greens! Back to the Companions real quick, I thought it was interesting how they all knew each other already. I really liked having them not be strangers. Sure, their dynamics are awkward and open to development—Ryan doesn’t like Graham much, and he and Yaz haven’t seen each other in years—but it gets the weirdness out of the way. Jill: Yes, that Ryan and Yaz knew each other from school was something I wasn’t expecting. James: One thing I liked a lot about the companions going into this is that...they didn’t do it as much with Bill, but the last few Who companions before that were all normal people that were secretly super important. The Girl Who Waited. The Impossible Girl. The Boy Who Lived. No wait, that last one’s Harry Potter, but you get my point! Beth: I mean, only time will tell. I’m guessing Graham is secretly Jesus. Hashtag Fan Theory. James: Yeah, there’s always a chance with Doctor Who there’ll be a timey-wimey reveal down the line—if I were a betting man, I’d say Ryan will be the one to have something “special” about him after he touched the lights that let Tim Shaw come down to Earth. But I really appreciate these are all just so far normal people, with their own messy web of relationships, caught up in a weird adventure—and I hope it keeps that to ground the fantastical elements. And of course, there’s nothing more fantastical than the Doctor, who...really, really probably shouldn’t have survived smashing into a train at that speed. Jill: Ha, yeah I was expecting an explanation of that. Beth: She’s the Doctor. It needs no explaining! James: Remember back when the fourth Doctor regenerated because he fell from a radio tower!? Beth: Women have a higher tolerance for pain. Sounds like that Fourth Doctor was kind of a wimp. Jill: Maybe it’ll be in a comic down the road! James: This was a lot higher than that. And with a much, much bumpier landing. But I just assumed it was like, latent regeneration energy protecting and healing her. If the 10th Doctor can get his hand lopped off and grow it back in the first hours of his regeneration cycle, the 13th can smash face first into a train. But god, what an entrance it was. You spend those first 15, 20 minutes of the episode getting to know all the other characters, wondering when Jodie is going to come in, and the minute she does, there’s no doubts. She is absolutely, 100 percent, the Doctor. She instantly becomes the core of everything going on. Jill: She was born to play a Time Lord. That really was my first reaction. You know, I previously have always felt awkward after a regeneration, there’s that time you need to “get used to” the new actor, but I didn’t feel that here at all. She is the Doctor. Full stop. Beth: There is a “vibe” new Doctors have, they step into the general sense of the role before shaping it to make it their own. With this performance, she slid into that vibe so seamlessly. You can tell she’s ready to make this one special, while also honoring the Doctors of the past. I’m confident this new Doctor is going to be an iconic one. James: They did a great job with just getting on with things—the first scenes on the train have a bit of that regeneration-episode wackiness, where she gets to channel that sort of David Tennant-y, Matt Smith-y quirky excitement. But after that—and she has that little nap on Ryan’s sofa—I think you really start getting to see the first layers of what this Doctor is going to be like. There’s still a lot of that youthful energy that feels like past Doctors, but at the same time there’s this quiet curiosity to her that really shines through. Jill: Oh my god, with so much history being made with her arrival I was super excited to see the Doctor making their own Sonic this time around. That felt like a really unique moment. James: We’ve gotten used to the Doctor walking into a room and immediately knowing what’s up, whatever the alien thing or weird tech is, but 13 feels like the sort of person who needs to poke about and ask a zillion questions—it’s all new to her and she is excited about that. I do hope she’s a gadget-y Doctor, because that’s something that I really liked in this episode—even with the villain, whose real name will be forever forgotten in favor of being called “Tim Shaw”—it was all about building things and using tech in interesting ways. It wasn’t just having a convenient MacGuffin on hand, it was about scraping together what the Doctor and her friends could to stop a threat. Beth: I feel like her standout moment was that showdown with Tim Shaw—side note, when she finally said “I’m the Doctor” I verbally squealed in my living room. She’d put all the pieces in place to stop him, but didn’t immediately execute her plan because she wanted to give him a choice. The choice to be good. That compassion, kindness, and respect for all—no matter how bad they seem to be—is at the heart of the Doctor. And when Carl pushed him off the crane, she admonished him for it. It may have looked “badass,” but it wasn’t the right thing to do. James: The whole moment with Tim Shaw on the bridge was really fun. But I do wish they’d actually stuck with that moment of Carl kicking Tim off the railing a bit more. Jill: Yeah, I expected more to come from that conversation other than “You had no right to do that.” Like, a good chunk of the audience will know why she said that, but not new viewers necessarily? James: The Doctor suddenly gets very righteously indignant about it—especially for a woman who’d just tricked Tim into setting off like, five apparently excruciatingly painful bombs inside his body—but then that scene just cuts out immediately, robbing the moment. And agreed, Jill. Fans know that’s a very Doctor-y thing to say, but in the context of the episode and the way it’s presented, it just looks a bit tonally off. I would’ve liked to hear the Doctor actually explain why, or talk about it in front of Yaz, Ryan, and Graham a bit more after the funeral—but I guess they’ve got a whole season to establish this Doctor’s ethos. Beth: They were distracted by Grace’s death. Justice for Grams! I didn’t mind it necessarily. I felt it got the point across, but yeah, newer viewers may not understand it. I didn’t mind it necessarily. Jill: I am sad we barely got to know Grace, I wonder if we’ll get flashbacks with her along the way. Beth: Apparently she’s in more episodes this season, so I’m guessing we will. Or it’s a parallel Grams, and Ryan’s going to abandon the team and live in a parallel world…oh wait that’s been done before, never mind! James: I hope that ends up true and not being a ruse—there were a few promo pictures out there that included Grace in scenes she was not actually in, but I hope we go back in flashback form to keep her around. But that was really, other than a few pacing issues—I know it’s a premiere and they needed to establish so much, but it was a little slow at times—my only real complaint. A few scenes needed to play out just a bit longer. A bit more time with Grace, a bit more with Tim Shaw on the bridge, a bit more with Yaz at the police station, little moments like that. Beth: What did we all think of Tim Shaw!? My first reaction to his face was “Channel Zero did it,” but I thought he was an interesting villain. And a freaking cheater! James: He should’ve kept his mask on, honestly. Way creepier without the gross teeth thing. Beth: I am hoping we get a follow-up to that whole “a bunch of hunter victims, including that one guy’s sister, are in stasis on his home planet” thing, but I’m guessing we probably won’t. Jill: I think my biggest issue so far, and it’ll be a wait and see kind of thing, is Ryan’s story including dyspraxia—a neurological disorder—which I don’t believe the actor has. There’s been a lot of talk about being more inclusive this time around and they are making strides, but that rubbed me the wrong way. And I’m concerned about how it will be presented as the season goes along, and how they talk about it. Beth: I felt it was weird how Grace just blurted it out to the Doctor without Ryan’s consent. James: They could’ve been a bit more delicate about it—which might feel odd to say after complaining the episode didn’t go enough into explaining some things—but it felt a little clunky and they just wanted to get it out there as soon as they could. I’m of two minds about it so far—I like that it’s something that’s very important to Ryan’s character, and I want to see it stay that way instead of just being conveniently dropped when they need him to do some action-y stuff or whatever. Jill: I’m not familiar with dyspraxia specifically so I don’t want to speak out of turn, but with a lot of disabilities there’s talk of “overcoming” them and sometimes, you just...can’t? And that’s ok. Not being able to ride a bike is ok! So we’ll see how it goes. James: So we’ve gone over the new Doctor and her friends, what we didn’t like, and all gotten to yell Tim Shaw at least once. What else stood out in this episode to you two? Jill: I love, love, love how the Doctor found her new outfit. Beth: Thrift shopping! While you never want to wear out something you bought at a thrift store, that outfit totally looks like something you could cobble together at a Salvation Army, and that made me very happy. James: I a) love that it took so long for someone to actually say to her “put some new clothes on!” and b) that it came from a charity shop. Beth: I mean, I was happy to see her in Peter Capaldi’s outfit for most of the episode, she looked good in the suit. James: I think there’s something beautiful in that idea that, anyone could go rummage around in a shop like that and suddenly become the Doctor. It makes a costume that, at first, looks very “costume-y” feel a bit more thrown together and normal. As normal as rainbow braces and culottes can be. Beth: I love her culottes so much. James: And the moment itself—the big curtain swish, the cape-esque flutter of the overcoat. Is so much fun. The look on the Doctor’s face is priceless! Jill: And so many pockets! Beth: The fact that she basically pulled a “Thanks, it has pockets” made it one of the best Doctor outfits ever. And what about that ending? It made me think of Total Recall and go “Oh they’re doomed. Eyeballs are gonna be bursting.” But I’ve already seen the “Next Time On” and they’re fine so it’s all good. Jill: Oh, we’d be remiss if we didn’t talk about that cliffhanger! Hell of a moment. Someone on one of our other Doctor Who articles wondered if their episode had cut off! James: A PROPER OLD SCHOOL DOCTOR WHO CLIFFHANGER!!! I know recent seasons, especially last season, tried to do that a bit more—with standalone episodes sort of blending into each other, but it felt like a great moment. Plus, if they’re about to immediately die of horrible space asphyxiation, at least they’re doing it with a drama of hair flutter. Jill: I’m assuming the TARDIS is going to just materialize around them, because, also, hi, I miss the TARDIS and am very keen to see the new interior. Beth: Have we gotten a good look at the new TARDIS yet? James: We haven’t! Which is something to look forward to. As is the new title sequence and theme tune. I assume they’ll be back next week, like there’s some unwritten law that a Doctor without a TARDIS is not allowed a new theme tune yet. Did you guys not get to hear the new theme tune at all yet? It played over the “coming soon” trailer at the end of the episode here in the UK. I love it. I can’t wait to hear it properly with the titles. I love how electronic and ethereal it is—it sounds like the classic versions of the theme. Jill: Yes, new composer this time around too! Interested to hear new themes and all. James: It’s bassy, and weird and... chunky. Rich, and comfortingly familiar. It’s like stew for your ears. Beth: I’m a bit on the fence about it, but it’s all right. But I’m also really used to the Moffat show theme, so it’s an adjustment. James: And, speaking of that coming soon trailer, I think it’s about time we wrapped up and looked to what’s coming soon for the Doctor and her friends. What do you want to see from season 11 now that the Doctor’s finally back in action? Jill: I just have to say, I adore Jodie Whittaker and I can’t wait to see her adventures with this crew. I hope we get to see a lot of interesting new aliens and go to places in history we haven’t yet. Beth: I don’t really have anything I want to see, more of what I don’t want to see. I grew tired of the massive prophecies and convoluted storylines we got in later Moffat years. I’m ready for a Doctor who’s cool with traveling in space and time helping people and meeting cool aliens. I have every confidence that Jodie Whittaker is going to shine in this role. I hope the show does right by her too. James: Agreed, Beth. I’m excited for just a lot of fun and adventure instead of grand prophecies or sudden twists. I was a bit hesitant coming into this season—nothing to do with Jodie, I had very high hopes for her and this episode proved that she couldn’t just match them, but vault over them like she leaps between cranes. It was mainly because Chibnall’s previous Who episodes were never really my sort of thing, and the thought of a season of episodes like that was a bit unnerving to me. I think there’s still a lot of stuff to see whether or not that hesitance fully goes away, but this episode did a lot to dispel that doubt. Jodie’s great, I can’t wait to learn more about the companions, but if this the style and tone of this new era of Doctor Who going forward? I absolutely can’t wait to see more. What did you think of “The Woman Who Fell to Earth”? What did you think of the new...well, everything? As always, let us know in the comments.